It always amazed me that the Nazi, big fan of uniformising everything, never developed a specific rank insignia for the Fuehrer himself. Here is one I designed, having gotten the idea from Hitler's standard. However, imho the Nazi fuhrerprinzip excludes the belonging of the Fuhrer to the ordinary chain of command, even if at its top. Hitler emphasised his position as supreme ruler by not being part of, and thus above any formal system of rank. That being said, another possible collar patch variant would be to include two Wehrmacht-pattern eagle devices in two opposite corners: These were present on Hitler's personal standard and indicated his position as supreme commander of the armed forces. Hitler DID have a personal rank in the SS: Oberste Führer der Schutzstaffel. Literally, "Supreme Leader of the SS", was a special title intended to be held solely by Adolf Hitler. When the SS became an independent organization from the SA, Hitler was listed on SS officer rolls as SS member #1 and the group's Supreme Commander. This title was intended to give Hitler a technically higher SS rank to Himmler (Reich Leader of the SS), but there is no photographic record of Hitler wearing an SS uniform, and there was no special SS insignia for Hitler above that worn by Himmler. ijnfleetadmiral wrote: Hitler DID have a personal rank in the SS: Oberste Führer der Schutzstaffel. Literally, "Supreme Leader of the SS", was a special title intended to be held solely by Adolf Hitler. When the SS became an independent organization from the SA, Hitler was listed on SS officer rolls as SS member #1 and the group's Supreme Commander. This title was intended to give Hitler a technically higher SS rank to Himmler (Reich Leader of the SS), but there is no photographic record of Hitler wearing an SS uniform, and there was no special SS insignia for Hitler above that worn by Himmler. I could see someone in one of the SS department designing one, not because Hitler would use it but either for propaganda reason ('The Führer, honoured member of the SS') or simply because of a need to make it official in this way (i.e. having it in a chart). As to what it might look like, I could see the insignia of Himmler but with a double wreath or a wreath surrounding the "SS" runes. 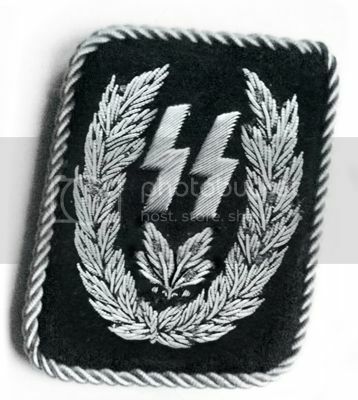 marcpasquin wrote: As to what it might look like, I could see the insignia of Himmler but with a double wreath or a wreath surrounding the "SS" runes. Either that or have it look just like Himmler's Reichsfuhrer insignia, but have gold in place of the silver. I don't think they would go for something that contains gold. In the book "Himmler's Black Order", the author mention that a number of stern memos were sent by himmler regarding the use of wermacht inspired coloured pipping instead of the plain silver one by member of the waffen-SS. Apparently, the use of a gold version of the SS eagle by Sepp dietrich was a particularly grievous disregard for the rules in his eyes.